Ballymena (from Irish: an Baile Meánach, meaning "the middle townland", [ən̪ˠ ˈbˠalʲə ˈmˠaːn̪ˠəx]) is a large town in County Antrim, and the eighth largest in Northern Ireland. It is part of Mid and East Antrim Borough Council. It had a population of 29,467 people in the 2011 Census. The town is built on land given to the Adair family by King Charles I in 1626, on the basis that the town hold two annual fairs and a free Saturday market in perpetuity. As of 2017, the Saturday market still runs. Ballymena is the hometown of notable actor Liam Neeson, who was awarded "Freedom of the Borough" in 2013. It is a popular shopping hub within Northern Ireland and is home to Ballymena United F.C. Ballymena incorporates an area of 632 square kilometres (244 square miles) and is home to large villages such as Galgorm, Ahoghill and Broughshane. The town used to host Ireland's largest one-day agricultural show at the Ballymena Showgrounds. The town centre has many historic buildings. The Town Hall was built in 1924 on the site of the old Market House, and was refurbished in 2007 at a cost of roughly £20 million. The recorded history of the Ballymena area dates to the Early Christian period from the 5th to the 7th centuries. Ringforts are found in the townland of Ballykeel and a site known as Camphill Fort in the townland of Ballee may also have been of this type. There are a number of souterrain sites within a 1 1⁄4 miles (2.0 km) radius of the centre of Ballymena. Two miles (3.2 kilometres) north in the townland of Kirkinriola, the ancient parish church and graveyard possess several indicators of Early Christian settlement, including a souterrain. Also in 1868, a gravedigger found a large stone slab on which was carved a cross with the inscription ord do degen. This refers to Bishop Degen, who lived in Ireland during the 7th century. This stone is now in the porch of St. Patrick's Church (of Ireland) at the end of Castle Street. At the end of the 5th century, a church was founded in Connor, five miles (8.0 kilometres) south of Ballymena. This was followed by a monastery at Templemoyle, Kells. In 831, however, the Norse invaded the Ballymena area and burned the church. In the 12th century, the Normans conquered much of County Antrim and County Down after having taken over England the century before. They created the core of the Earldom of Ulster. During this campaign, they built great mounds of earth topped by wooden towers, referred to as mottes, as defensive structures. The Harryville (Ulster-Scots: Herrieville) area's motte-and-bailey is one of the best examples of this type of fortification in Northern Ireland. Some sources, however, credit the Uí Fhloinn with building the mid-Antrim mottes and baileys in imitation of the invaders; the Uí Fhloinn defeated and repelled the Earl of Ulster, John de Courcy, in 1177 and 1178. In 1315, Edward Bruce (brother of King Robert I of Scotland, known as "Robert Bruce") invaded Ireland. On 10 September 1315, at the Battle of Tawnybrack (five miles (8.0 kilometres) south of Ballymena at Kells), Edward conquered the army of Richard De Burgo, the Norman Earl of Ulster. In 1576, Queen Elizabeth I granted land, including the town of Ballymena, to Sir Thomas Smith. The lands had been forfeited to the crown after Shane O'Neill's resistance in the 1560s. Smith brought English settlers to the area, among the first pioneers in planting English and Scots settlers in Ireland. By 1581, Smith's settlement failed and the lands reverted to the crown. 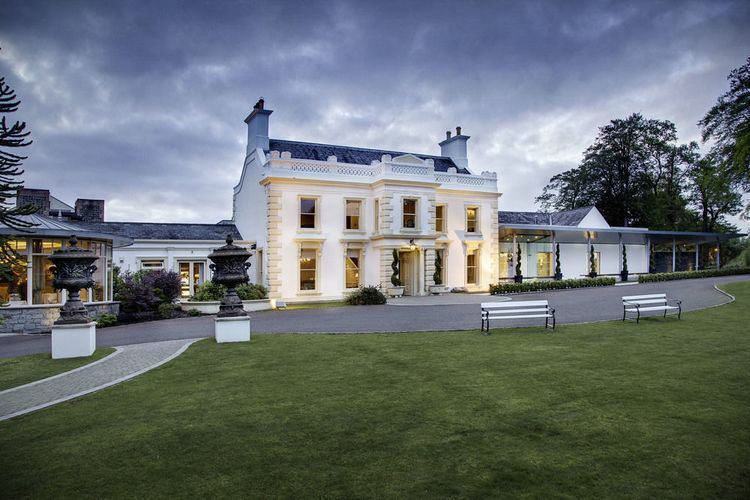 On 10 May 1607, King James I granted the native Irish chief, Ruairí Óg MacQuillan the Ballymena Estate. The estate passed through several owners, eventually passing into the possession of William Adair, a Scottish laird from Kinhilt in southwestern Scotland. The estate was temporarily renamed "Kinhilstown" after Adair's lands in Scotland. The original castle of Ballymena was built in the early 17th century, situated to take advantage of an ancient ford at the River Braid. In 1626 Charles I confirmed the grant of the Ballymena Estate to William Adair, giving him the right to hold a market at Ballymena on every Saturday. He hired local Irish as workers on the estate; they served as tenant farmers for much of the next two centuries and more. In 1641, the local Ballymena garrison were defeated by Irish rebels in the battle of Bundooragh. Ballymena's first market house (on the site of the present town hall) was built in 1684. By 1704, the population of Ballymena had reached 800. In 1707, the first Protestant (Church of Ireland) parish church was built. In 1740, the original Ballymena Castle burned down. The Gracehill Moravian settlement was founded in 1765. During the 1798 rebellion, Ballymena was occupied from 7 to 9 June by a force of around 10,000 United Irishmen. They stormed the Market House (now the Town Hall), killing three of its defenders. In 1870 The People's Park, Ballymena was established. Now a mature and beautiful setting, it continues to be a very popular park in the early 21st century. In 1900, Ballymena assumed urban status. Under the provisions of the Irish Land Act of 1903, the Adairs disposed of most of their Ballymena estate to the occupying tenants in 1904. The "old" town hall building, which also contained the post office and estate office, burned down in 1919. Prince Albert, Duke of York (later King George VI) laid the cornerstone to the new town hall on 24 July 1924, and it was officially opened on 20 November 1928. The Urban District Council petitioned for borough status and the Charter was granted in December 1937. The first meeting of councillors as a borough Council was held on 23 May 1939. The population of Ballymena reached 13,000. Ballymena Castle was demolished in the 1950s. In 1973, the Urban and Rural District Councils were merged to create Ballymena Borough Council. Following local government reoganisation in 2015, the Borough Council was merged with the Boroughs of Carrickfergus Borough Council and Larne Borough Council. During the Second World War, Ballymena was home to a large number of evacuees from Gibraltar. They were housed with local families. 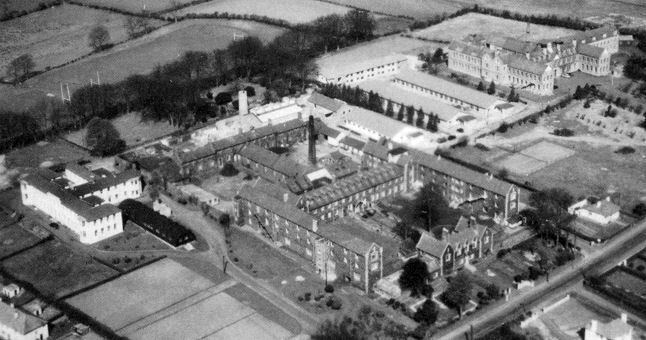 In the 1950s St Patrick's Barracks in Ballymena was the Regimental Training Depot of the Royal Ulster Rifles (83rd & 86th). Many young men who had been conscripted on the United Kingdom mainland, along with others who had volunteered for service in the British Army, embarked upon their period of basic training in the Regimental Depot, prior to being posted to the regular regimental battalions. Many of these young men were to serve in Korea, Cyprus and with the British Army of the Rhine. In 1968 due to a series of government austerity measures, the remaining three Irish regiments, Royal Inniskilling Fusiliers (27th) Royal Ulster Rifles (83rd & 86th) and the Royal Irish Fusiliers (89th) merged to become the Royal Irish Rangers. Early in the 1990s the Royal Irish Regiment, whose Regimental Headquarters was at St Patrick's Barracks, was granted the Freedom of the Borough. Like other towns in Northern Ireland, Ballymena was affected by the Troubles, a lengthy period of religious and partisan tensions and armed confrontations from the 1960s through 1998. A total of eleven people were killed in or near the town, most of them by various loyalist groups. During the later half of the 20th century, Ballymena, like many other once prosperous industrial centres in Northern Ireland, experienced economic change and industrial restructuring; many of its former factories closed. since the early 21st century, Ballymena is becoming a centre of information-based, international corporations and major retail outlets. It does retain a very successful manufacturing sector, with major employers such as Michelin and JTI, and the extremely successful local firm Wrightbus. In March 2000, the actor Liam Neeson, a native of Ballymena, was offered the freedom of the borough by the council, which approved the action by a 12–9 vote. The Democratic Unionist Party objected to the offer and drew attention to his comments from an interview in 1999 with an American political magazine, George. Neeson declined the award, citing tensions, and affirmed he was proud of his connection to the town. Ian Paisley was eventually made a freeman of Ballymena in December 2004 instead. Ballymena is described by some observers as being at the heart of Northern Ireland's equivalent of the Bible Belt. It has a large Protestant majority. In the early 1990s the Democratic Unionist Party (DUP)-dominated town council banned a performance by the Electric Light Orchestra in the township, saying they would attract "the four Ds Drink, Drugs, Devil and Debauchery". The Council banned the screening of Brokeback Mountain (2005), starring Jake Gyllenhaal and Heath Ledger, as it featured a homosexual relationship. An impersonator of comic Roy 'Chubby' Brown was also banned. 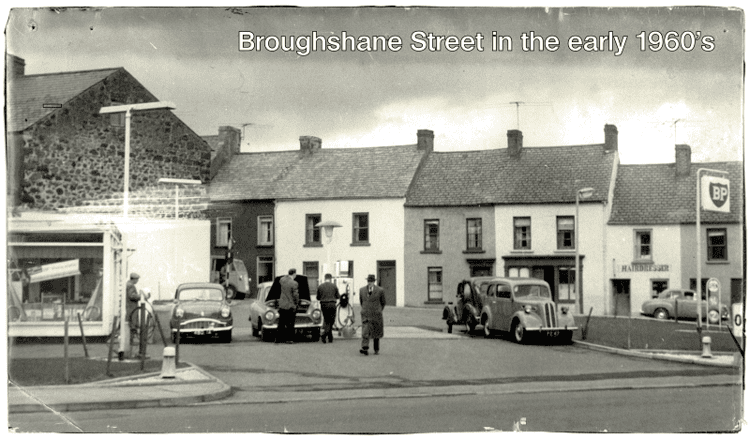 The majority of the town's Catholic population is situated around the Broughshane and Cushendall Road areas. Recently there has been tension in the Dunclug area of the town which now has a Catholic majority. These tensions have been associated with internment bonfires and the flying of republican flags; the town has tried to reduce tensions. Recreational drugs have been a major problem in the town, earning it the moniker "the drugs capital of the North". However major steps have been taken in recent times to deal with this. In 2011 it was revealed that Ballymena has the third-highest level of legal gun ownership in Northern Ireland. Ballymena is about 10 km (6 mi) from Slemish Mountain, the legendary first-known Irish home of Saint Patrick. The mountain rises about 1,500 feet (460 metres) above the surrounding plain, and it is the central core of an extinct volcano, commonly known as a volcanic plug. According to legend, following Patrick's capture and being brought as a slave to Ireland, the young man worked as a shepherd at Slemish Mountain for about six years, from ages 16 through 22, for a man named Milchu (or Miluic). During this time Patrick turned to frequent prayer in his loneliness. In a vision he was encouraged to escape and return home. He did, became a Christian priest and returned to Ireland, allegedly to convert his old master. The legend tells that his true conversion occurred when he was on Slemish out in all weathers, communing with nature and praying continuously. As Patrick was not the first Christian bishop to visit Ireland, his ministry was confined to the North. Here he established churches and an episcopal system. One such church is thought to have been founded at the nearby site of Skerry Churchyard. Slemish Mountain is open year-round, and on Saint Patrick's Day (17 March), large crowds hike to the top of the mountain as a pilgrimage. The 1.5-kilometre round walk to the summit and back takes approximately one hour in good weather. Excellent views can be had of the Antrim and Scottish coasts to the East. Ballymena town, Lough Neagh and the Sperrin Mountains are all normally visible to the West whilst the Bann Valley and the higher summits of the Antrim Hills can be seen to the North. The 180-metre climb is steep and rocky. The path can become very slippery in wet weather so tourists are advised to take care. Ballymena, throughout the course of The Troubles, had a large paramilitary presence in the town. The UDA South East Antrim Brigade was stationed here. Ballymena is a market town, but industry developed in the town. The 1980s were a time of job losses in Ballymena as industry suffered. Michelin has a large presence in the Borough (in Broughshane), and JTI Gallaher has a large presence in Galgorm. In November 2012, the Patton Group, a major builder in the borough, entered administration with the loss of 320 jobs. It was announced in October 2014 that JTI Gallagher's would be closing with a loss of 877 jobs, which was a massive blow. Wrightbus, however, have been a source of better news locally. It has been awarded contracts to build the New Routemaster buses for Transport for London and sees continuing growth. Professor Darwin Caldwell, robotics expert and leader of iCub project. Alexander Campbell, leader in the Restoration Movement in the United States. David Cardwell, Senior Guide and Director of the Guide for Social justice. Sir Roger Casement, human rights activist in the Congo Free State and Peru, and Irish nationalist, was educated as a youth in this town. His father died and was buried here; relatives on both sides of his family cared for Roger and his brother Tom when they were orphaned. Sir Samuel Curran, physicist, inventor of the Scintillation Counter, and founder of Strathclyde University, was born in Ballymena. Steven Davis, Southampton F.C. and Northern Ireland International midfielder was born in Ballymena, though raised in Cullybackey. Joseph Dyas, led the Forlorn Hope at the Storming of Badajoz on two occasions in 1811 whilst serving with 51st (2nd Yorkshire, West Riding) Light Infantry. He was buried in Ballymena in 1850. Timothy Eaton, the Canadian businessman who founded Eaton's department store, was born in Ballymena. Graham Forsythe, the Canadian artist, was born in Ballymena. Jackie Fullerton, BBC Sports broadcaster. Joanne Hogg, a vocalist, was born in Ballymena. David Humphreys, Ulster and Ireland fly half. Ian Humphreys, Ulster and Ireland fly half and brother of David. Sharon Hutchings (née McPeake, born 22 June 1962) is a former high jumper from Northern Ireland. She won a silver medal at the 1986 Commonwealth Games in Edinburgh with a lifetime best of 1.90 m (6 ft 23⁄4 in). Matt McCullough, Ulster and Ireland rugby lock. James McHenry, signatory of the United States Constitution. Tom McKinney, Jed-Forest rugby union; Salford, Warrington, St Helens, Great Britain rugby league footballer. Ronald Mason, a Head of Programmes for BBC Northern Ireland and BBC Head of Radio Drama, was born and raised in Ballymena. George Millar, singer, founding member of musical group The Irish Rovers, born and raised in Ballymena. Dr. Syd Millar, the former Ireland rugby player and current chairman of the IRB, was born in Ballymena; in 2004 he was awarded the Freedom of the town. Colin Murdock, Accrington Stanley F.C. and former Northern Ireland International. Liam Neeson, the Oscar-nominated actor, was born and raised in Ballymena and was awarded the Freedom of the Town on 28 January 2013. James Nesbitt, actor, born 15 January 1965 in Ballymena. Ian Paisley, the former First Minister and founder of the Free Presbyterian Church, was raised in Ballymena. Mary Peters, Northern Irish Olympian, was raised in Ballymena. Richard Seymour, Marxist writer, activist and owner of the blog Lenin's Tomb. Nigel Worthington, the former Northern Ireland, Ballymena United and Sheffield Wednesday left back, as well as being the former international team manager. Alexander Wright, a Victoria Cross recipient during the Crimean War, was born in the town. Bryan Young, Ulster and Ireland international rugby player. It had a population of 29,467 people (12,105 households) in the 2011 Census. 3.9% of people aged 16–74 were unemployed. Ballymena railway station opened on 4 December 1855. A station was opened at Harryville on 24 August 1878, but closed on 3 June 1940. The Ballymena, Cushendall and Red Bay Railway operated narrow gauge railway services from Ballymena to Parkmore from 1875 to 1940. The Ballymena and Larne Railway was another narrow gauge railway. The line opened in 1878, but closed to passengers in 1933 and to goods traffic in 1940. Between 1878 and 1880 the line terminated at Harryville, but was then extended to the town's main railway station. Carniny Amateur & Youth F.C.